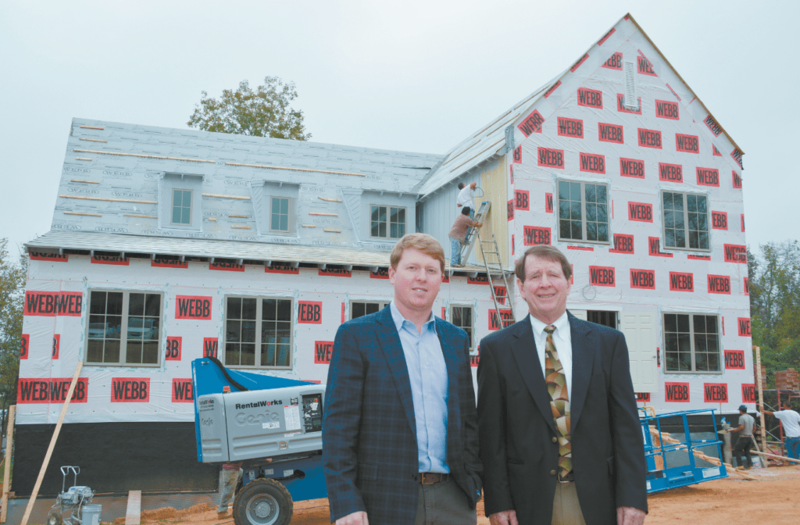 This month, Russell Greenhalgh, right, and son Adam, left, are celebrating the company’s anniversary by building a new office that will not only give their employees a better experience, but will add to growth in Cahaba Heights. Journal photo by Jordan Wald. When Ted Greenhalgh started Greenhalgh Insurance in 1937, setting up in the Southside of Birmingham, the idea of buying liability insurance was new for many homeowners. Eighty Years later, the company has not only served its community by providing the insurance, it has spread its coverage across 25 states. But its heart and headquarters remain in Greenhalgh’s hometown. This month, Ted’s son Russell and grandson Adam are celebrating the company’s anniversary by building a new office that will not only give their employees a better experience, but will add to growth in Cahaba Heights. “We just started building this year and it has been nice to be able to build something that will add to the community,” said Adam Greenhalgh. One of his close friends, Cahaba Heights Leaf and Petal owner Jamie Pursell, is developing land on Crosshaven Road for a new location of the flower market along with a second location of Crestline Bagel and Becky Satterfield’s new Latin American restaurant El Zun Zun. The Greenhalghs would take an active role in the community because they insure many businesses there, but Adam and Russell’s passion for Cahaba Heights springs from it being their home. Russell grew up just across the street from what is now Vestavia Hills Elementary Cahaba Heights and raised his children on Locksley Road in Mountain Brook, just about three minutes from the office. Their affinity for the location is the reason the business was moved from downtown Birmingham to Cahaba Heights 35 years ago. “I remember when all there was across the street from the office was a grocery store and then there was the post office,” Russell said. Building a new office is something Adam said has been a dream of theirs for more than 20 years. With the company having continued success each year, now is the time to build, he said. They won’t have far to travel, though; they are relocating to a new office on the lot right next to their current spot. Both Russell and Adam said the tornado that hit Cahaba Heights in April of 2011, though a tragedy, brought the community closer together. Though they have dealt and continue to deal with claims for damages caused by natural disasters across the country, Russell noted that having a storm hit so close to home was eye opening. While the office suffered minor damage in the form of a few lost roof shingles, much of the area was without power for 11 days. Russell noted that the company had more than 230 claims accounting for more than $8 million in losses caused by tornadoes across the state that day. Much of those losses were suffered by their clients in Cahaba Heights. Russell recalls the early days of the company and the hard work his father put in when the insurance industry was beginning to take off. The business was started with a $5,000 loan, referrals from Ted’s uncle and a lot of knocking on doors. “He (Ted Greenhalgh) would go out to the metal roof houses that were being built in Trussville when the veterans from World War II were coming back from the war,” Russell said. It wasn’t always Russell’s intention to take over the family business, but after serving in the Navy from 1971 to 1973, he jumped in. In 1980, when his father retired, he took over with the mission to continue its growth. Russell, Adam and their staff will be celebrating the 80th anniversary in their current space, but they hope to move into the new office building in the spring.